The Purple Egalitarian text, in Hebrew, English and Spanish, is surrounded by three dimensional paper-sculpture flowers. The play of light emphasizes the shadows. A light coloured delicate butterfly is resting on the vine. 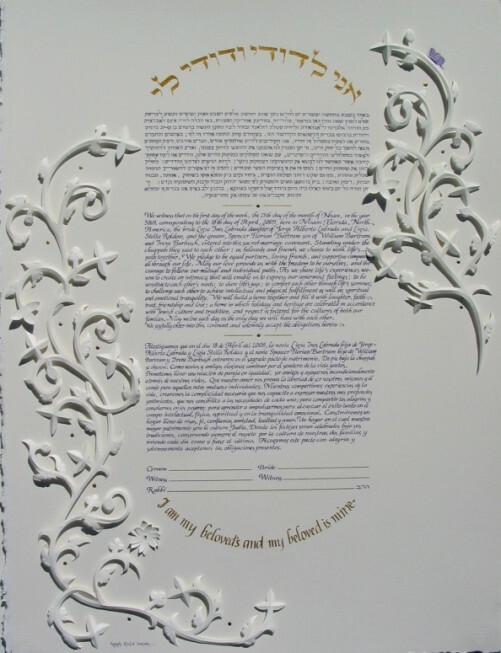 "I am my beloved's and my beloved is mine", written both in Hebrew and in English in gold, which adds beauty and meaning to the whole Ketubah.